Stardew Valley is a great place for farmers, and it offers a lot of various activities. Working on the farm, you can also learn new skills, change professions, play games, and participate in festivities. The most interesting thing about this game is that you can find somebody to love, and marry one of twelve characters. When you have a husband or a wife, they help you with everyday routine, watering your flowers, and feeding your animals. They also move to your place, and you can build your relations, achieving new love points with your spouse. So, how you can make someone love you? Obviously, you have to be involved in his or her life, talking and spending time together. But it’s not the only thing required: every friendship in Stardew Valley starts with gifts. You can give your loved one gifts up to two times a week. Don’t forget about birthdays, since birthday presents will have an increased (eight times) effect on your friendship. Different villagers have different tastes, so we collected necessary information on gifts. If you know best gifts for your loved one, your friendship will turn into love! 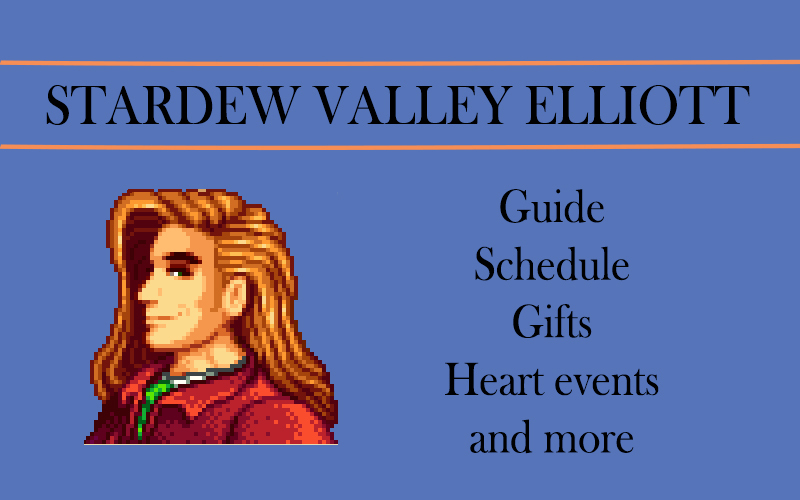 We keep introducing Stardew Valley bachelors, and in this article we will talk about Elliott. He’s a writer, and he lives alone on the beach. He’s a creative person, and he dreams about writing a wonderful novel which will make him a living classic. Sometimes he drinks at the Stardrop Saloon, but we decided to present you his entire schedule, so you could know where to search for your future husband. Generally, Elliott’s behavior is the same in spring and summer, except rainy days, when he’s often at his home. In winter and autumn, from Monday till Wednesday, he reads books in the library. In spring, on Monday, he leaves his home and goes to the Forest, which is near Leah’s house at 11:30 AM. After 3:00 PM he goes north of the Beach, and stands on the Bridge. On Tuesday, Wednesday, and Saturday, you can find him either south of his house, near the Fire Pit, or on the Bridge. On Thursday, he’s at Pierre’s General Store from 11:30 AM to 5:30 PM. On Friday and Sunday, he’s at Beach Campfire from 12:00 PM. In summer, on Monday, Saturday and Wednesday, you can meet him staring at the river near Leah’s house. On Tuesday 9th, he visits the Clinic. On Thursday and Friday, at noon, he’s at Pierre’s General Store. During fall, on Monday, Tuesday, Wednesday, and Saturday, Elliott spends most time in the Library. On Thursday, from 12:40 AM to 5:30 PM, he’s at Pierre’s Store. On Friday, he visits Campfire Pit at 12:00 PM, and the Beach at 3:20 PM. On Sunday, he’s at the Stardrop Saloon from 6:00 PM to 11:50 PM. In winter, on Monday and Wednesday, you can meet him either in the Library, or in Museum. On Tuesday and Saturday, he reads books in the Library. On Thursday, he’s at Pierre’s Store. On Friday, at 3:20 PM, he goes north of the Beach, and stands there on the bridge. On Sunday, Elliott visits the Saloon at 5:00 PM. Now you know where to find Elliott, let’s figure out which gifts he would appreciate most of all. Elliott loves all items from the Universal Loves category. He also would be happy to receive Duck Feather, Pomegranate, Crab Cakes, Tom Kha Soup, and Lobster. Elliott would like such gifts, as Squid and Octopus. He is completely neutral to Fish (with a few exceptions), and Eggs. We suggest you no to give him Daffodil, Chanterelle, Holly, Common Mushroom, Dandelion, Purple Mushroom, Leek, Winter Root, Morel, Snow Yam, Hazelnut, Wild Horseradish, and Pizza. Elliott really hates such Stardew Valley gifts as Sea Cucumber, Amaranth, Salmonberry, and Quartz. In Stardew Valley, your relations with every villager are measured in heart points. The more hearts you have with someone, the more unique scenes you unlock. The two-heart event is at Elliott’s cabin. You will have a small talk, and he will ask you which kinds of books you like. Choose any answer and earn +30 friendship points. The four-heart event is in the Stardrop Saloon. Enter it from 3 PM to 10 PM, if Gus is on his workplace. Elliott will order you wine and propose a toast. Drink to your friendship or to Pelican town, and earn 50 or 25 friendship points, respectively. The six-heart event of your Stardew Valley romance is at Elliott’s cabin; he will play piano and talk about how difficult his life is. He will say that he would like to be a farmer like you. You can offer him to move to your farm, however, he will stay where he is. The eight-heart event takes place in the Museum, from 1 PM to 7 PM. Elliott will send you an invitation, and you will see many villagers who gathered to hear Elliott’s first book. After reading, he will thank you and say that you inspired him to write it. Once you reached ten hearts with Elliott, he will invite you on a “maiden voyage”, and you will have a little boat trip. He will say how much he feels about you, and then kiss you.